Five things to know about video poker! When it comes to the casino, there are many great games that we have available at Coral. Along with the traditional casino classics like roulette and blackjack we have a host of other games, and we will be looking at one of those specifically now – video poker. This will outline what it’s about and give players some tips and advice on how to succeed, then you’ll be ready to for action! Firstly, you need to know what it’s about. Obviously from the name, you will gather it involves poker, however, there are some differences to the game you may be accustomed too. But don’t worry, if anything this is easier to play as it’s not as complex. Video poker’s simplicity to play is an advantage and it acts as a combination of poker and the slots, although you will always have control unlike some video slots. So if the waiting around between hands, and the many strategies that come with poker isn’t your thing, then the speed and ease of video poker could be for you. As this is computerised you will find many different variations of the game, and whilst they are all reasonably similar, it is important that you know the exact details when it comes round to playing for some cash. At Coral you will find games like Aces and Faces, Jacks or Better, and Tens or Better. The latter are fairly simple to play and you will grasp it in no time, but either way, it’s vital to pick the right game for you and ensure you know what it’s about in order to be successful. Don’t treat it a slot! As mentioned, being on a computer and the characteristic of a game, means that people treat video poker like a slot – and that’s a big mistake. Slots are spinning and hoping for the best, you have no control. Whereas, here it’s about decision making and concentrating on the game, if you do that the house edge will become more favourable for you. If you don’t follow any strategy or apply thoughts and knowledge, you’ll lose. So, fix up! This may seem risky and nobody wants to lose big stakes, but playing the maximum coins (5) will actually be beneficial to you. That’s because machines offer bonuses and obviously bigger payouts for the maximum coins, and over a longer period, the more bonuses you get the more chance of winning you have. Of course, if you can’t afford to do so, then don’t you can still win, but if you are in it for the long haul, it will be beneficial. Yep, playing video poker will only boost your knowledge of poker and is often seen as the perfect stepping stone to playing poker. That’s because ultimately, you are getting a feel while learning about the different combinations and hands. If you aren’t confident about playing poker straight away, then ease your way in with video poker – although we don’t know why you don’t enjoy both! 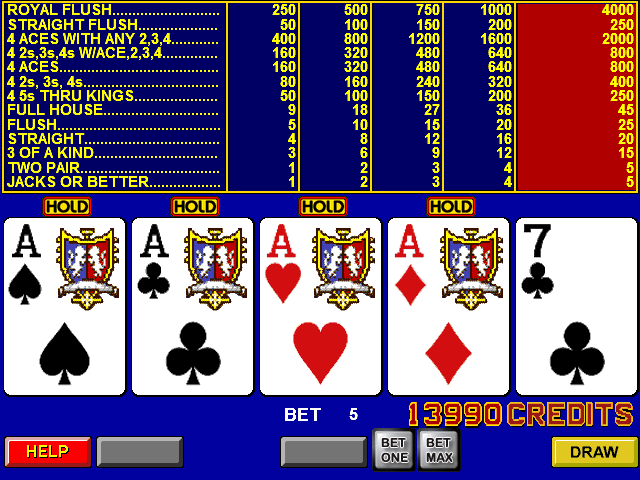 So, there you have it, giving you some tips and advice when it comes to playing video poker. Learn how to play, read up on the games and then you will be ready to take our video poker tab by storm. Good luck!